Enhnaced for iOS 8! Now with new document manager, unlimited subfolders support and document templates! Writer by the developers of the popular Textilus app is a must-have writing tool for everyone that writes on the iPad: writers, students, poets, journalists, bloggers, business people, creative people, etc. Enhanced for iOS 8, Writer is a special edition of Textilus focused 100% in writing and document management useful and flexible features. Create rich-text notes, articles, letters, blog posts, papers, drafts, business documents, emails, reports, etc. right on your iPad and export & share your work as PDF, RTF, RTFD, ePub, HTML or PNG documents. – Less is more. No cluttered user interface. Just focus on your creation process not the tool. – Quickly move around the cursor. Quick keys for tab, forward delete, up, down, left, right, etc. Customize our extended keyboard with your own keys. – Easily create folders and subfolders for your projects and documents. Customize the covers of every folder. – Bold, italic, underline, line spacing, highlight, indents, subscript/superscript, alignment, lists, type size, text and paper colors, etc. – You’ll be saved the work of repeatedly recreating basic content and layout information. – Save and backup different versions of your documents. Passcode app secure protection. Writery will automatically save your documents and it has a Snapshot function to save versions from time to time and prevent data loss. – Characters, words, reading time, sentences, average word length, etc. 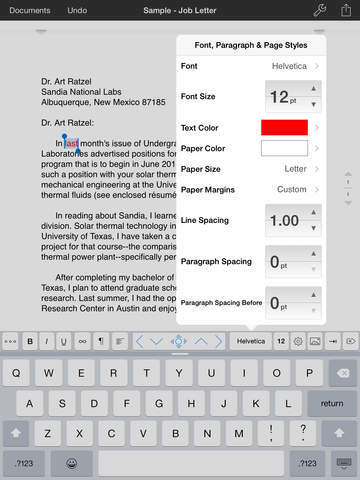 Writer by Textilus is the best choice for writing text documents right on your iPad. If you like Textilus Writer, please take the time to give us a nice review: it really helps.